Traveling to Goa by Bus? Yes! What if i told you it's gonna be rewarding for you. Get Flat Rs. 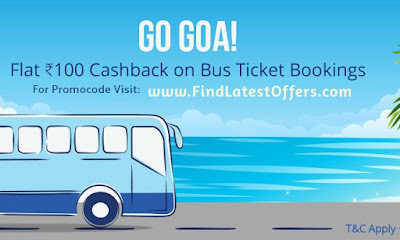 100 Cashback on Bus Ticket of Goa. Enjoy Bus Ride. Stay Tuned for more latest offers of Bus, Movies and Recharges. One more thing to share, now we have our custom domain: www.FindLatestOffers.com.